The worldwide wrestling community was shaken last week when the IOC ruled that it would remove the sport from the 2020 Olympics. This decision left many in disbelief—after foot racing, wrestling, added in 708 B.C., is the oldest sport in the history of the Olympics. Over the years, it has provided us with some iconic Olympic moments, including USA Heavyweight Rulon Gardner’s upset of Russia’s seemingly invincible Aleksandr Karelin in the Greco-Roman Gold Medal Match at the 2000 Olympics. What would Milo of Croton, a fabled Greek wrestler so feared that he won one set of Olympic Games when nobody dared to challenge him, have to say about this? 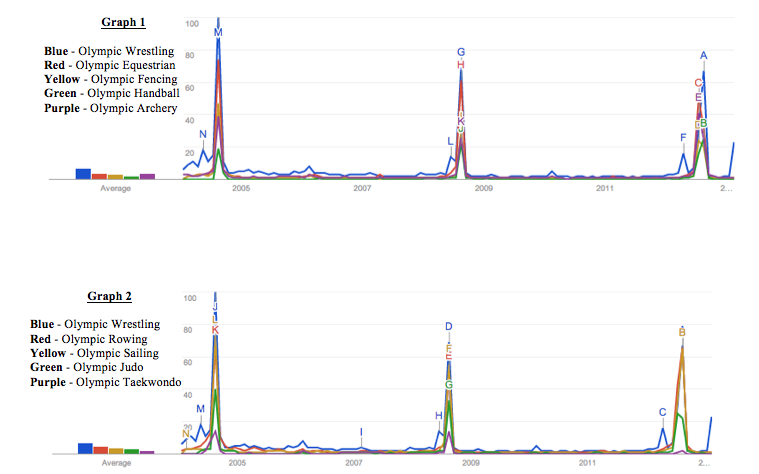 Obviously, the search volume peaked for each sport during the summers in which the Olympics were held. Out of the nine sports in this sample, not only was Olympic wrestling never among the least popular searches in any of the last three Olympics, but it was the most popular each time. Though its Google Index has been decreasing over time, it is nowhere near as low as several of the other sports have consistently been. If any of these sports suffers from lack of popularity, it would undoubtedly be taekwondo, which was far and away the least searched sport in the sample each year. Olympic fencing and judo also showed signs of a systematic decrease in popularity over the last three Olympics. For some reason, Olympic rowing jumped up in popularity by 15 index points at the last Olympics, though this sudden internet popularity spike may be attributable to a certain American bronze medal winner, whose all-too-revealing photo received a healthy amount of publicity. While the motives of people googling Olympic rowing may be murky, one thing can be said with certainty: wrestling is in no way the least popular Olympic sport. Milo of Croton rolls over in his tomb. Are you looking at US data only? I ask because handball, for example, is a massive mainstream sport in Europe – in several countries it’s the second biggest sport after soccer. It wouldn’t be surprising if it didn’t appear highly in US searches since it’s almost unknown in North America. But the Olympics are a global movement. No, this is actually using worldwide data. Here is the comparison between wrestling and handball alone: http://www.google.com/trends/explore#q=olympic%20wrestling,%20olympic%20handball. Wrestling is also incredibly more popular abroad, especially regarding freestyle and greco-roman wrestling, the styles used in the Olympics. Interesting. I certainly think that one of the most important reasons for wrestling to be kept in the Olympics is its international profile. The list of medal-winning nations is extremely diverse. Except in other languages the word for handball and wrestling will be different (same for all the other sports). So really you are only getting results here for US/England/Australia, etc. I think it’s still fair to say. Apart from soccer there’s no one sport that dominates in most countries. Handball is definitely up there with basketball, ice hockey and the like. One thing, you say the further north you go the less it’s played, but the rules were codified in Denmark and the sport is huge there. The national teams are extremely successful. And just most recently, Norway has won the last two women’s Olympic titles and Sweden and Iceland have won the last two men’s silvers. Anthony – great data and support for keeping wrestling in the Olympics. Could you please take out the reference to the rower picture and then post to the Save Wrestling Websites and Facebook page? Those sites are read by lots of wrestlers – old and young – and a lot of them would find that offensive. Thanks for doing the research. Well done with the research. The gut reaction of most people, including people who are not particularly fans of wrestling, has been disblief. While wrestling is not really “made for TV”, and the silly rules changes (to please the IOC) have taken it backwards in appeal and development, what sport could be much more of an embodiment of the Olympic ideal? still can not believe of all sports they cut wrestling! wow so it takes a harvard sports analyst to use google trend? a nutless monkey can use google trend. can’t believe you’re actually using that as a credible source. i have no doubt that wrestling is not the least popular sport, but I would expect better research coming from an article like this. In my opinion, prior to the IOC secrete vote, there’s no question a conflict of interest existed on the IOC board that was a direct cause of the resulting vote. In addition, the IOC board allowed the existence unequal representation between modern pentathlon’s and wrestling’s interest, during the discussions leading up to their vote. As a result of this vulgar mismanagement of authority, I submit my recommendation for the immediate termination of all board members of the IOC. Your analysis is a little off since the Olympics start in July. Judo, for example, was mostly finished by the time August started in 2012, while Wrestling was competed only in August. To follow up on that – nobody has to type in “Olympic Archery”, “Olympic Rowing”, or “Olympic Judo”. Wrestling is the only sport in your list that needs the “Olympic” string to get relevant results for someone who wants to see Olympic stories versus Pro Wrestling. How would your analysis have been different without “Olympic” being part of the search string? Remember, no one searches for olympic wrestling. They search for freestyle, greco, greco-roman, etc. wrestling. Also, they don’t necessarily search for “wrestling”, they may also search for pale, brottning, paini or wrestling in any other language. I went ahead and checked for you. I agree with your premise – Wrestling is much more popular than many other Olympic sports. But your analysis is beyond flawed. Your research is also flawed Judo Boy. I did the research same as anyone else on here can and you need to verify if you are looking at peak or average, also use just “Wrestling” just like you use “Judo”. Either way your numbers are also not accurate. Jup. Just replace “judo” with “olympic judo” and “olympic wrestling” with “wrestling. There ya go. Wrestling is the national sport in several European and Middle Eastern countries. You guys are getting off topic with the serach results. The premise of this article was that wrestling is FAR from the least popular sport and everyone (thus far) agrees with this statement. Don’t get offended with a comparison as to whether or not your sport is more popular please. WRESTLING (ENGLISH), LOTTA (ITALIAN), LUTTE (FRENCH), LUCHA (SPANISCH) BOPBA (RUSIA) LUTA (PORTUGUESE) AND I CAN CONTINUE. Everyone who wants to search in his country try it in his lenguage first!! What this is all about is content for American television. If you look at the sports which have been added you find sports which are familiar to the American armchair fan, such as golf, sports with a certain amount of titillation, such as beach volleyball, and intense action which ends quickly so the network can cut to an advertisement. That would be BMX. We already have the Special Olympics and the Para-Olympics, maybe it’s time for the “real Olympics” as well. I think wrestling is being removed to make room for Brazilian Jiu-Jitsu (BJJ), a very similar but better 😀 sport. Wrestling is better than bjj (static and boring tv sport) in MMA. The major number of UFC champions have Olympic WRESTLING base. And Wrestling is a dynamic sport.